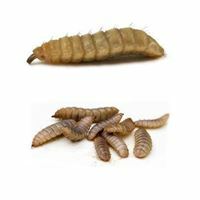 Black soldier fly larvae are considered the best new alternative for incorporating calcium and protein into an animal's diet. 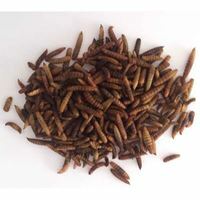 During its larva phase, the black soldier fly feeds off various kinds of organic material, converting this to proteins. This is why Calci-Yum Worms have such a high nutritional value. The variety of natural colors in this mix are eye-catching to all animals and the great taste will keep them coming back for more! Excellent for Backyard Chickens, Bluebirds, Sugar Gliders, Hedgehogs, Squirrels, Skunks, Reptiles, and other insect eating animals. These worms are roast-dried to maintain their nutritional value, and store for a year or longer. No refrigeration necessary! Excellent source of protein and loved by backyard chickens, bluebirds, cardinals, other wild birds, turtles, fish, reptiles and other insect eating animals. Research has shown that natural feed with balanced Ca:P ratios increases animal health and contributes to stronger bones and shiny feathers. Calcium is especially important for laying birds because a lack of it can result in poor laying, soft shells, and can cause behavior problems such as egg eating as the bird tries to recoup the much needed calcium. 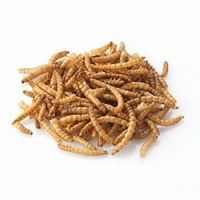 Calci Worms can be offered straight or mixed with other foods to make a custom blend. Place in a feeder or sprinkle on the ground to encourage natural foraging behavior. This product is a treat and should be fed sparingly, it is not a substitute for a regular, balanced diet. Offer treats 2-3 times per week or as a small portion (less than 10%) of the main diet. Treats may lead to health issues like obesity when overfed. If your pet is not consuming its regular balanced diet, withhold serving treats until stable eating habits resume. crude protein (min) 45%, crude fat (min) 35%, crude fiber (max) 8%, moisture (max) 8%, calcium (min) 3%.